I read Sibella Giorello's blog post pronouncing Tessa Afshar "a name to remember." As Sibella has this disturbing habit of being right about things like this, I checked out Tessa's Web site. To my utter joy, I found a kindred writing spirit – historical, Old Testament fiction. A godly woman I tell you, godly. So I bought her book. And I read it. I highly recommend you do both of those things too. Ms. Afshar has taken the story of Rahab and created a thought-provoking, spiritually uplifting, and dramatically poignant story of tender divine redemption overcoming stubborn human resistance. Liberally sprinkled with snippets of unexpected humor (what a unique writing voice! ), A Pearl in the Sand digs deeply into the tortured soul of a woman who simply cannot believe that there could be a future for one with such a past as hers. Through no fault of her own, Rahab is slow to win the hearts of her newly adopted people – and especially the heart of one in particular (cf. Matt. 1:5). When she does win their – and his – love, she has no idea what to do with it. Shamed by a past she cannot erase by her own power, her life crumbles until, like the walls of her hometown, Jericho, almost nothing is left standing. It is not until she and her husband receive by faith the grace God extends to both of them that she comes to understand her value through His eyes. At her website, you'll discover she has an MDiv from Yale. She ministers to women. So does her novel, but it's not only for women. There are priceless nuggets of wisdom for both men and women on relating to God and relating to each other, all woven seamlessly into the context of Rahab's and Slamone's story. And if that's not enough to move you, guys, there's also a battle scene, okay? Okay. 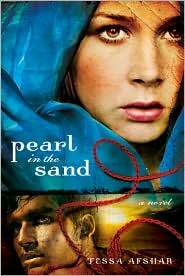 Tessa Afshar is indeed a name to remember, but I think she'll prefer you remember the message she delivers so powerfully in Pearl in the Sand. The book is a gem in and of itself.